Too many people have been avoiding their vaccinations, and four of the worst diseases ever to infect a boardgame are making a comeback: the yellow cubes, the blue cubes, the red cubes and the black cubes. But through a horrible mutation, those diseases are not just cubes anymore, they are dice, and that makes them more unpredictable than ever before. That’s the basic idea of Pandemic: The Cure. 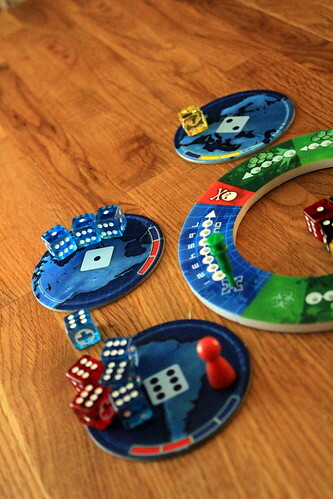 It recreates Pandemic, one of the most popular cooperative games ever, as a dice game. And not a small one, either, there are more than 80 dice in the box. 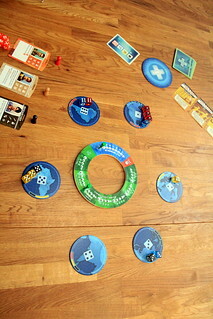 The setting of Pandemic: The Cure will be immediately familiar to anyone who played Pandemic. Four diseases are ravaging the world, and the players, specialists working for the CDC, have to contain those diseases until they can develop a cure. Just like the original Pandemic, each player takes on a specialist role, like the Medic or the Researcher. Each role has special abilities that let them do their job better than anyone else and each role has its own dice. That’s relevant because the dice you roll at the start of your turn tell you which actions you can take, and each role has different distributions of symbols on the dice. You’re not completely at the mercy of the roll. If you don’t get the actions you really need, you can reroll your dice as many times as you want. You’ll probably expect a catch in all this rerolling, and you’re right, it’s not free of risk. Each die has one face that shows a biohazard symbol. We’ll get to what those do in a moment, but don’t expect anything good. Also, biohazards can’t be rerolled. That would just be too easy, wouldn’t it. But lets assume for a moment that you roll better than yours truly – one roll, five dice, four biohazards – and actually get to do something useful. Two actions are for traveling. The world map in Pandemic: The Cure is less detailed than it was is Pandemic, there are no cities or countries, only six regions. You would call them continents, except India that is separate from the rest of Asia, bringing the number up to six for dice-related reasons. A ship on your dice lets you travel to an adjacent region, a plane to any of the six. Not all specialists get to use planes to travel, Researcher and Scientists only have ships at their disposal. We don’t know why that is, either, but we suspect it’s related to them overspending from their expense accounts at that conference in Tijuana. When you are where you need to be, you can use the other actions from your dice. A syringe is for treating diseases, you use it to move one Disease Die from your region to the Treatment Center or from the Treatment Center back into the Dice Bag. Both steps are important. Dice on the region tiles can cause Outbreaks, so you want to get them to the Treatment Center quickly. But an empty Dice Bag makes you lose the game, so getting them back into the bag is also important. Everyone can cure diseases, but only the Medic has double and triple syringes on his dice to cure more than one Disease Die with a single action. With a sample jar you can collect one Disease Die and keep it with you to research the Cure for that disease later. Finding all four cures is the goal of the game, but taking all the samples you can get is not the way to go. As long as you keep the sample with you, it locks the Action Die you used to take it, so it pays to be more discerning with your sample jars. After you took all your actions, you may make one attempt to find a cure. To do that, you roll all your dice of the right color, and if the result is 13 or higher the cure is found. That means, quite obviously, that you need three samples to have a chance to find the cure, and that more samples give you better odds. To make things easier, you can give samples to another player, putting together your research. Once a cure is found, treating that disease gets much easier and you always remove all matching Disease Dice from a region with a single action. Finding all four cures is also the only way to win the game, so don’t put it off for too long. 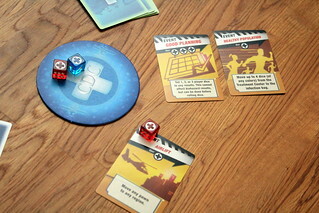 Some roles get extra symbols on their dice to power their special abilities, like the Dispatcher who can use a helicopter result to airlift another player to anywhere in the world. That leaves the biohazards. They sound pretty harmless, all they do is advance the Infection Rate marker by one step. That becomes a problem when the marker advances into a new section of the scale which happens every four steps. When that happens, you immediately roll all Disease Dice from the Treatment Center plus the number of dice given by the current Infection Rate and put them all back into play. That’s another good reason to keep your Treatment Center clean. And if the infection marker ever reaches the end of the track, you immediately lose the game, so don’t push your luck to hard with the rerolling. It wouldn’t be a very good Pandemic game, or indeed a very good cooperative game, if bad things didn’t happen. Bad things happen at the end of each players’ turn, when they have to draw as many Disease Dice from the Dice Bag as the current infection rate tells them to and spread them across the world. The six regions are numbered from one to six, and when a Disease Die enters play you roll it and place it in the matching region. When you get more than three dice of the same color in one region, you get what all Pandemic players fear: an Outbreak. With an Outbreak, the dice that caused it goes into the next region and the Outbreak Marker advances by one. If the next region already has three dice of that color as well, then there is another Outbreak, and so on. Get to eight Outbreaks and you lose the game again. 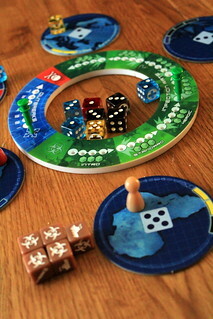 Just like its ancestor, Pandemic: The Cure has more than enough ways to lose the game. But at least the Disease Dice aren’t all bad. They can all roll a cross instead of a number, in which case they are not placed in any region but on the CDC tile. Dice from the CDC can be used at any time to buy one of the three available Event Cards. Those helpful cards can often help you out of a tight situation, and some of them are old friends from Pandemic. You still get One Quiet Night, for instance, to skip adding Disease Dice at the end of your turn. Other events have new effects that affect the dice, and you may get the chance to reroll biohazards or even set the results of some of your Action Dice – if you can pay for the event cards. With this many dice involved, I don’t have to tell you that Pandemic: The Cure involves a good amount of luck. If you’re rolling your Action Dice like me you can expect to spend some time floating around in your ship and advancing the infection marker without doing anything useful. The push-your-luck mechanic of rerolling actions you don’t need works, though, you get to decide between somewhat useful actions or the risk of another roll to get the result you really wanted. Sometimes, your bad luck screws with you, but we didn’t lose a game so far to bad rolls, only to bad decisions. If anything, Pandemic: The Cure is tuned to be a bit too easy to make up for possible bad rolls, I mostly wish the end was a bit tighter. So the game ends up a bit easier than Pandemic, and also a bit lighter. The biggest difficulty in the original was how to use your city cards effectively. Those don’t exist in The Cure, and the decision when and what to reroll is not trivial, but not as difficult as how to use cards in Pandemic. How you travel around the world and how diseases spread is also much less of a problem with only six regions connected in a circle compared to the transportation network on the Pandemic board. Despite all the differences, Pandemic veterans will quickly find their way around this new game. All the core concepts are there, adapted to the different mechanics of a dice game but very recognizable. Pandemic: The Cure doesn’t manage to take the cooperative throne from its older brother, it just doesn’t have the bite for that. It’s too easy, needs to little planning and coordination. But dethroning Pandemic in my eyes is still a very difficult thing to do, so that comparison isn’t exactly fair. The Cure is a lighter version of Pandemic, shorter and more kid-friendly. If you like the idea of Pandemic but find it a bit too heavy, then The Cure is exactly what you’re looking for. And if you enjoy Pandemic as it is you will probably enjoy playing a few rounds, just don’t expect it to replace Pandemic.